My job is to teach eighth graders about systemic injustices, like racism, transphobia, sexism, and socioeconomic classism. All eighth graders in my charter school's network (who are mostly students of color) are required to complete the class I teach, which is designed to turn them into critical thinkers prepared for college and the world that awaits them. Seeing their faces ignite with passion as we discuss college-level concepts — as they grasp the idea that being poor is no accident, and as they realize how race, class, gender, and sexuality are all interlocked — is almost indescribably fulfilling. But now, impending dread has replaced my delight. 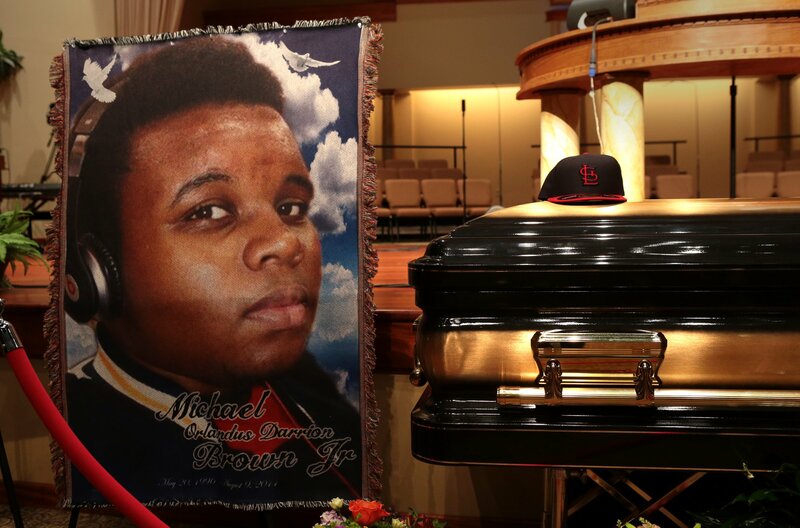 In light of a Ferguson, MO grand jury’s decision not to indict Officer Darren Wilson in the shooting death of unarmed 18-year-old, Mike Brown Monday, I am speechless. We learned about Mike Brown as a class in September, mere weeks after his bullet-riddled body was left to soak up a beaming August sun for over four hours. We read, annotated, and discussed an article that detailed Brown’s death. We discussed police brutality and what it means in communities of color. We also examined the viral hashtag, #IfTheyGunnedMeDown, and explored the differences in the media’s treatment of suspected Boston Marathon bomber Dzhokar Tsarnaev and of Mike Brown. I can honestly say that all 129 of my 13- and 14-year-old eighth graders were outraged. I have no idea how to protect them — or my brother, my nephew, my nieces, my boyfriend, my father, my mother, or myself, for that matter. We are all seen as expendable. And being expendable is a difficult concept to teach to eighth graders. But all of my 129 of my 13- and 14-year-old eighth graders were also optimistic. One student said with confidence that he believed Wilson would be convicted and sent to jail for the remainder of his life. “You can’t just kill somebody and get away with it,” he explained. All of his classmates nodded in agreement. Watching the breaking news blaring from multiple television networks Monday night, I hoped their optimism would still be intact when we return to school from Thanksgiving break. Because I now know their worlds are irrevocably changed. It will be impossible for them to fathom how their parents and relatives are being imprisoned and deported in record numbers, but an officer can kill an unarmed teenager and still enjoy Thanksgiving dinner with his family. In some ways, Thanksgiving vacation is a reprieve from the bombardment of questions that I know are sure to come. It gives me time to gather my thoughts, and to figure out how to unpack the injustice delivered to Ferguson with a group of 129 students of color in Denver, who still see the glass as half-full. But right now, I have no answers for them. When we return to school, I can tell them about police states and racism. We can discuss the prison-industrial complex. We can examine and annotate infographics about police brutality, and the pervasive myth about black-on-black crime. But how can I tell them their lives are in danger? That at 13 and 14, they may have hours, days, weeks, months, or a few years before they encounter their Darren Wilson or George Zimmerman? How can I find the courage to tell them their names and faces can be soon plastered on posters and used as a rallying point for activists seeking to dismantle the system that allowed for their deaths? Educating them will never be enough. Hugging them will never be enough. I have no idea how to protect them — or my brother, my nephew, my nieces, my boyfriend, my father, my mother, or myself, for that matter. We are all seen as expendable. And being expendable is a difficult concept to teach to eighth graders. Teaching about racism is difficult. Teaching about homophobia and transphobia is difficult. Teaching about cultural appropriation and sexism and socioeconomic classism and the genocide of American Indians is difficult. But telling these optimistic eighth graders that their lives have little value to those whose jobs are to protect and serve them is a task nobody, including me, is prepared for. You'd think I'd have had time to practice by now — after the deaths of Rekia Boyd and Trayvon Martin and Aiyana Jones and Eric Garner and so many others. But every time this happens, I find myself at a loss for words.